1. Stop using direct affiliate links. You probably already know that it’s a good idea to cloak (hide) your affiliate links. Doing so will help ward off the link hijackers who switch in their affiliate ID for yours, and thus steal your commission when they buy the product. It also virtually reduces the number of buyers who “cut off” the affiliate portion of a link and go straight to the sales page (perhaps thinking that doing so will somehow give them a better deal). But there’s another reason to use direct affiliate links: Namely, because you could end up with hundreds of “dead” links all over the Internet. You see, if you make a blog post, Twitter about an affiliate product or include your direct affiliate link in an ebook, then what happens if the vendor stops selling that product? You’ll have dead links. Maybe hundreds of them. If instead you use a redirect link, you can change the redirect link to point from the dead affiliate link to a similar affiliate product in just a minute or two. And in doing so, you could potentially save thousands of dollars in affiliate commissions. 2. Look for these common sales leaks. If you don’t vet the sales process thoroughly, you may find that the biggest thief is the product vendor! Sometimes the vendor is just a new marketer who doesn’t know any better. Other times, you may find vendors who are deliberately trying to rip you off. * Google AdSense ads on the sales page. Some marketers don’t realize that a sales page shouldn’t have any distractions, and that the only way to leave a sales page is via a back button or the buy button. Other marketers know exactly what they’re doing – you send them traffic for free, and they get the money every time someone clicks on their ads. Either way, avoid these vendors. * Alternative payment options. Another sneaky way product vendors reach into your pocket is by offering multiple payment options on the affiliate landing page. This is only troublesome IF you don’t get credit if the customer chooses a different option. For example, if the vendor uses Clickbank for affiliate tracking, then obviously you won’t get a penny if the vendor encourages customers to call their orders in. * Customer service reps that send visitors to a new page. Watch out for this sneaky trick: sometimes when a prospect has a question, the customer service rep (or the vendor) sends the customer to a different sales page. End result? You lose the commission! 3. Find out what loopholes the vendor will use to keep your money. Here’s one last tip: Always read the TOS (terms of service) and affiliate agreement. Sometimes you’ll find outrageous payment thresholds that allows the vendor to legally keep your money until you reach that threshold! Other times the vendor charges a huge “accounting fee” just to cut you your check. There you have it – three quick and easy ways to start banking bigger affiliate paychecks. 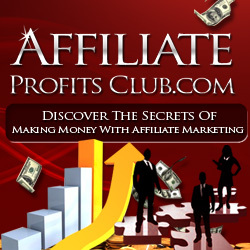 To find out how the super affiliates keep those checks rolling in day after day, you can claim a free Silver Membership at Affiliate Profits Club (normally $27.00) – Just Use This Special Link For Access.